Lynden Energy Corp. announced today that it has exercised its option on the Mitchell Ranch and converted it into a lease. They have also leased 35,000 acres to a large, independent eploration and production company. This appears to be a very good deal for Lynden as they now own the lease for the Mitchell Ranch. They will also retain a 1.25% royalty interest. 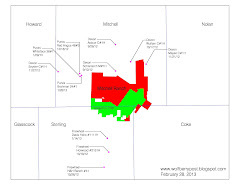 Also included is the return of the mineral rights above the base of the Strawn formation. The most significant part of this deal is the sharing of technical information between the large company and Lynden. Because the large company is targeting the rights from the Strawn and below, they will be drilling through the Wolfcamp. Lynden and CrownQuest will be able to review the logs to gain further understanding of the Wolfcamp at the large company's expense. Also, a deal with a large company provides opportunities for a potential buyout in the future. Lynden Energy up 18% today!